I picked up some beets at the farmers market last weekend and threw this together for dinner tonight. It was divine. It's the kind of salad that a restaurant around here would charge you $15 for. Besides the beets, I had all of the ingredients on hand, thanks to my beloved Trader Joe's. I'm not one to gush over a salad, but this combination is my very favorite and I'd happily eat it every day. Wrap each beet individually in a ball of aluminum foil. Place foil balls directly on oven rack at 425F, roast for 45 minutes and set aside to cool. When they're cool enough to handle, open the foil and peel the beets; the skin should come off with just a little rubbing. Slice beets. Combine the rest of the ingredients (amounts to taste) and beets and top with your favorite vinaigrette. 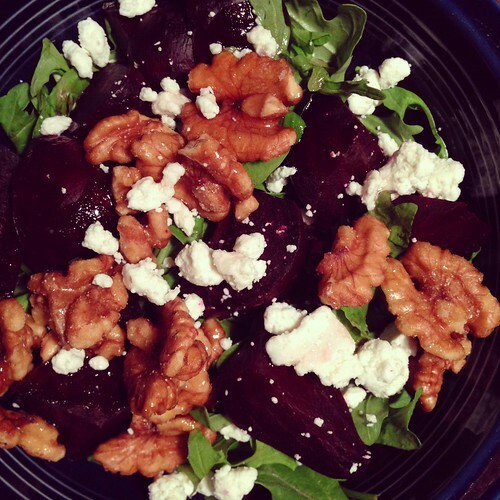 I'm not a huge fan of beets, but this salad look great, I would like to try it!